This example shows how to design an array of PID controllers for a nonlinear plant in Simulink that operates over a wide range of operating points. The plant is a continuous stirred tank reactor (CSTR) that operates over a wide range of operating points. A single PID controller can effectively use the coolant temperature to regulate the output concentration around a small operating range that the PID controller is designed for. However, since the plant is a strongly nonlinear system, control performance degrades if operating point changes significantly. The closed-loop system can even become unstable. Open the CSTR plant model. For more information on this system, see . Obtain a plant model for each operating region. The usual practice is to linearize the plant at several equilibrium operating points. Design a family of linear controllers, such as PID controllers, for the plant models obtained in the previous step. Implement a scheduling mechanism such that the controller coefficients, such as PID gains, are changed based on the values of the scheduling variables. Smooth (bumpless) transfer between controllers is required to minimize disturbance to plant operation. Assess control performance with simulation. For more information on gain scheduling, see . 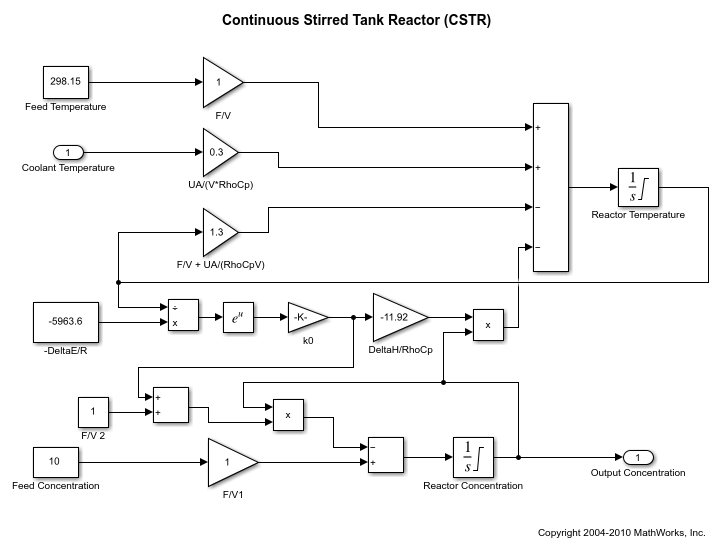 This example focuses on designing a family of PID controllers for the nonlinear CSTR plant. The output concentration C is used to identify different operating regions. The CSTR plant can operate at any conversion rate between a low conversion rate (C = 9) and a high conversion rate (C = 2). In this example, divide the operating range into eight regions represented by C = 2 through 9. Create an array of default operating point specifications. Initialize the operating point specifications by specifying that the output concentration is a known value, and specifying the output concentration value. Compute the equilibrium operating points corresponding to the values of C.
Linearize the plant at these operating points. Since the CSTR plant is nonlinear, the linear models display different characteristics. For example, plant models with high and low conversion rates are stable, while the others are not. To design multiple PID controllers in batch, use the pidtune function. The following command generates an array of PID controllers in parallel form. The desired open-loop crossover frequency is at 1 rad/sec and the phase margin is the default value of 60 degrees. Display the controller for C = 4. 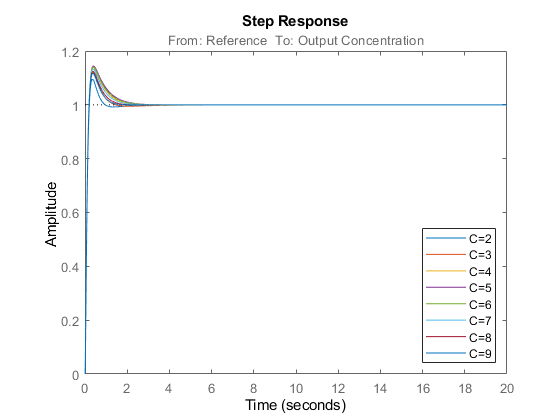 To analyze the closed-loop responses for step setpoint tracking, first construct the closed-loop systems. All the closed loops are stable, but the overshoots of the loops with unstable plants (C = 4, through 7) are too large. To improve the results, increase the target open-loop bandwidth to 10 rad/sec. Design updated controllers for the unstable plant models. 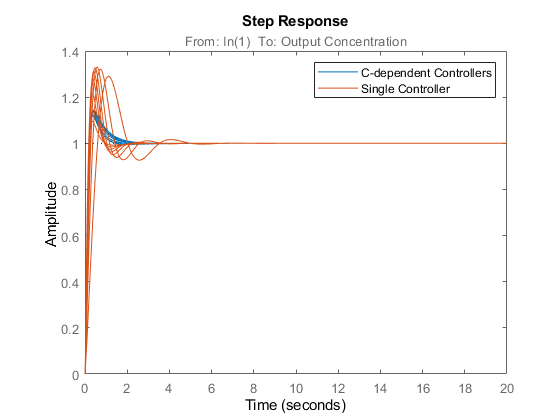 Construct the closed-loop systems, and plot the closed-loop step responses for the new controllers. All the closed-loop responses are now satisfactory. For comparison, examine the response when you use the same controller at all operating points. 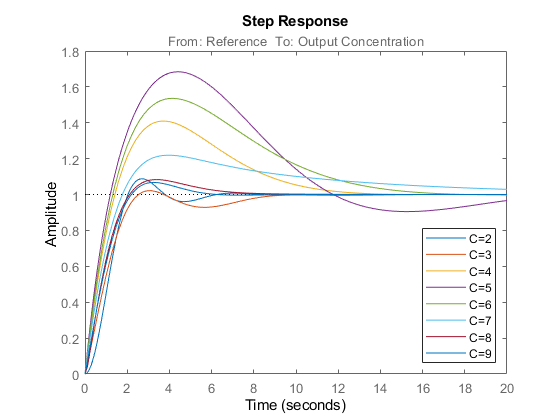 Create another set of closed-loop systems, where each one uses the C = 2 controller, and plot their responses. The array of PID controllers designed separately for each concentration gives considerably better performance than a single controller. However, the closed-loop responses shown above are computed based on linear approximations of the full nonlinear system. To validate the design, implement the scheduling mechanism in your model using the PID Controller block. Seborg, D. E., T. F. Edgar, and D. A. Mellichamp. Process Dynamics and Control, 2nd Ed., Wiley, 2004, pp. 34-36. Rugh, W. J., and J. S. Shamma. "Research on gain scheduling." Automatica, Issue 36, 2000, pp. 1401-1425.